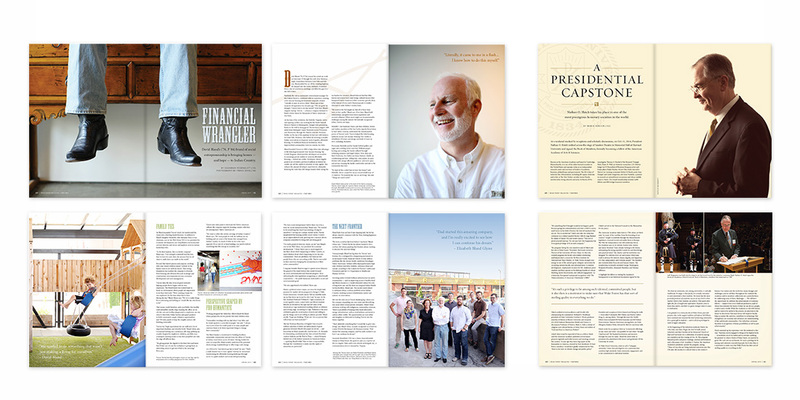 An article about Travois, a company that helps Native Americans get loans; and a feature on President Hatch’s induction into the American Academy of Arts & Sciences. 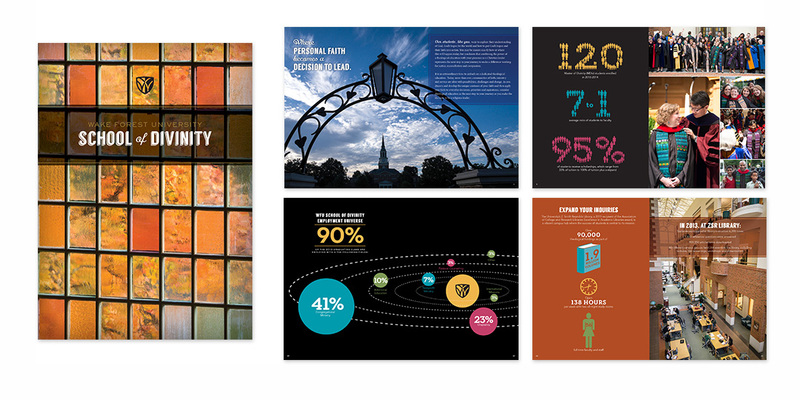 Viewbook for the School of Divinity, introducing prospective students to the program, giving statistics about the student body, and sharing the philosophy of the curriculum in clear and approachable designs. 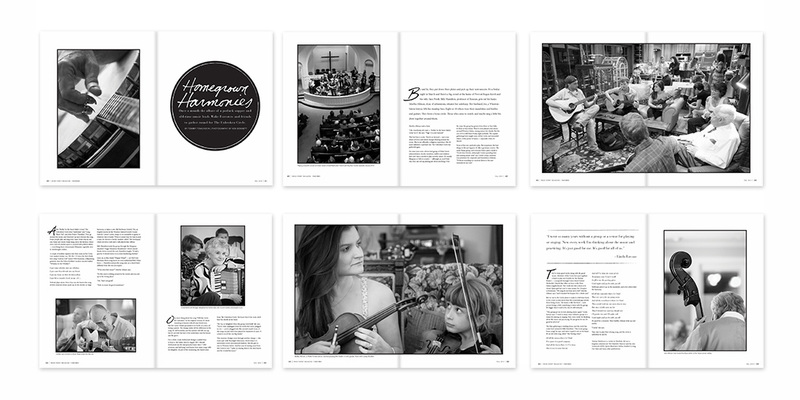 An in-depth article about the Unbroken Circle, an informal musical group. 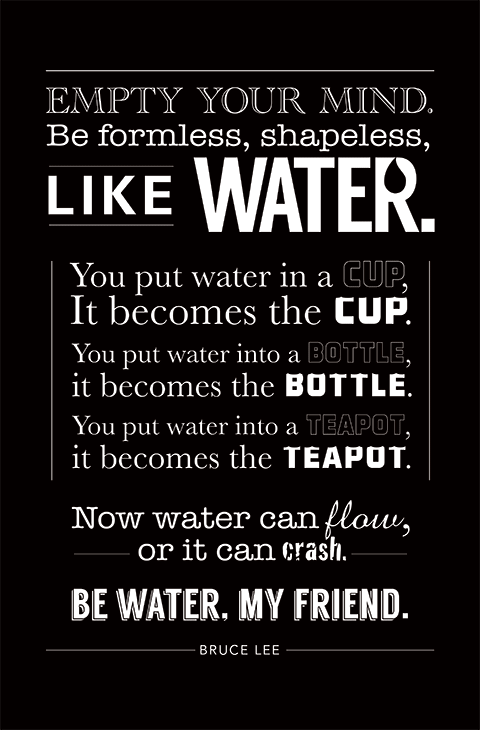 A poster of a famous Bruce Lee quote. Designed for a friend. 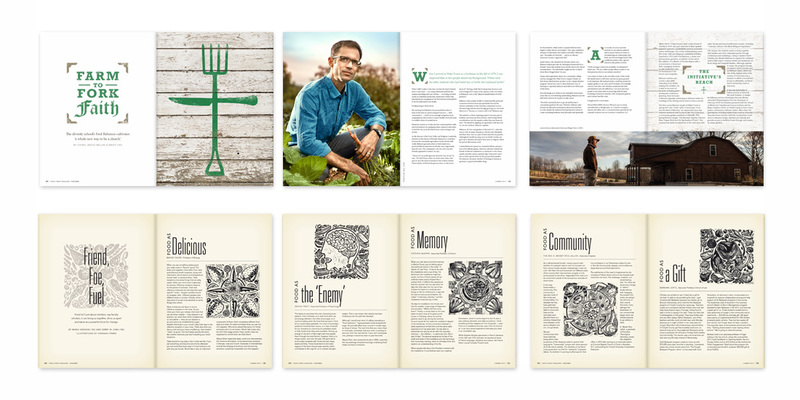 An article about Fred Bahnson’s Farm to Fork Faith food initiative, and a series of different takes on food with illustrations by Hannah Firmin. 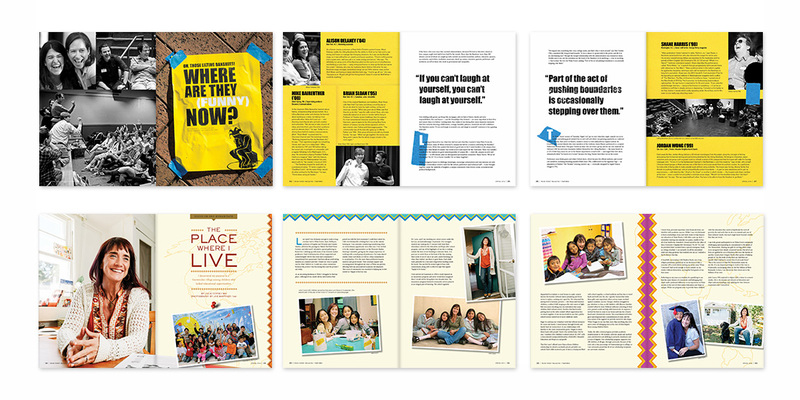 An article about alumni of the campus comedy troupe, the Howling Banshees, and an alumna’s take on her work with youth in Guatemala. 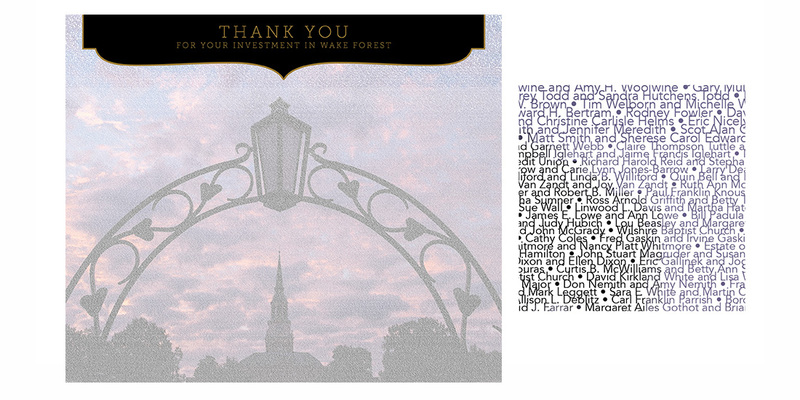 Answering the challenge of recognizing 32,000 donors to the Wake Will capital campaign, this 8 x 10-foot image uses all of the names to reveal an iconic photograph of campus (photo by Ken Bennett). Names increase in size from bottom to top, with the smallest names in 10-pt font. 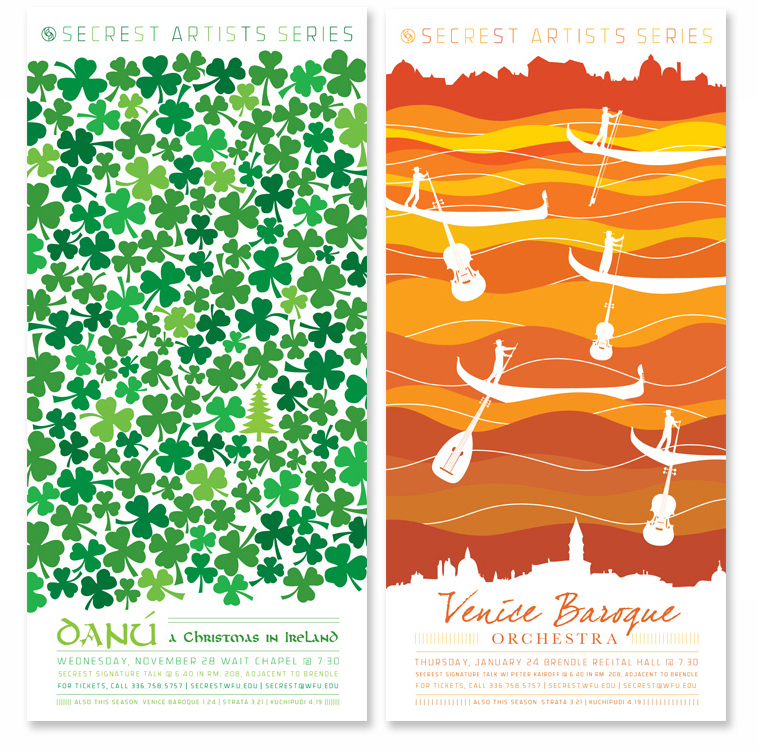 Poster for the 2013-2014 Secrest Artists Series. 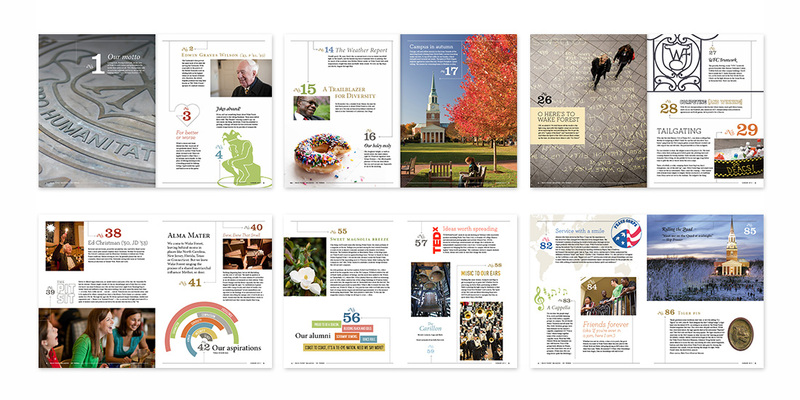 This special issue of Wake Forest magazine featured 101 Things We Love About Wake Forest – an opportunity for a lot of interesting imagery! 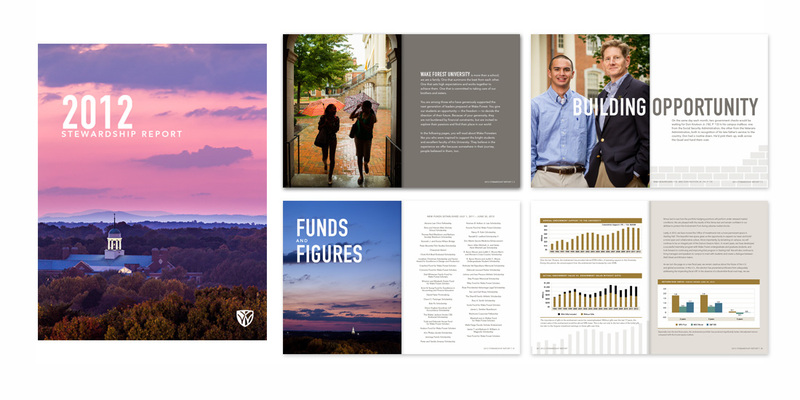 The annual stewardship report contains stories of scholarship donors and recipients, and data on the endowment’s performance. Winner of a Silver Award in the 2013 National CASE Circle of Excellence. 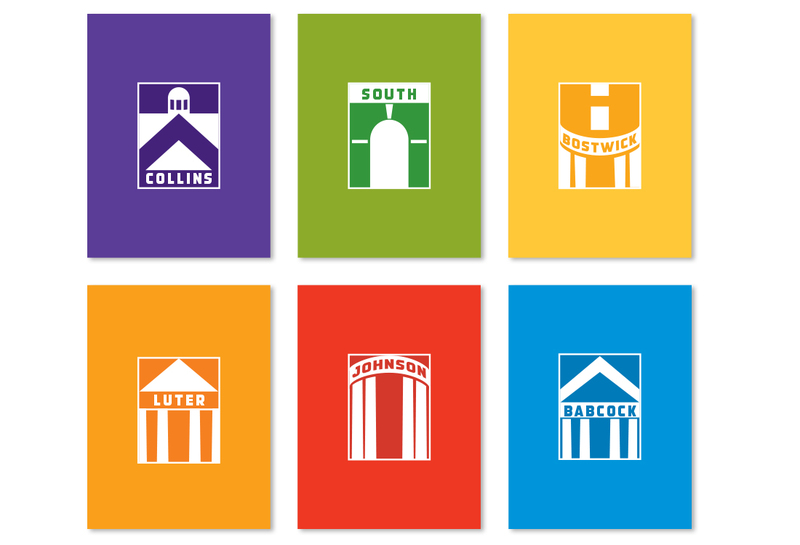 Logo concepts for the six freshman dorms, based on their architectural features. 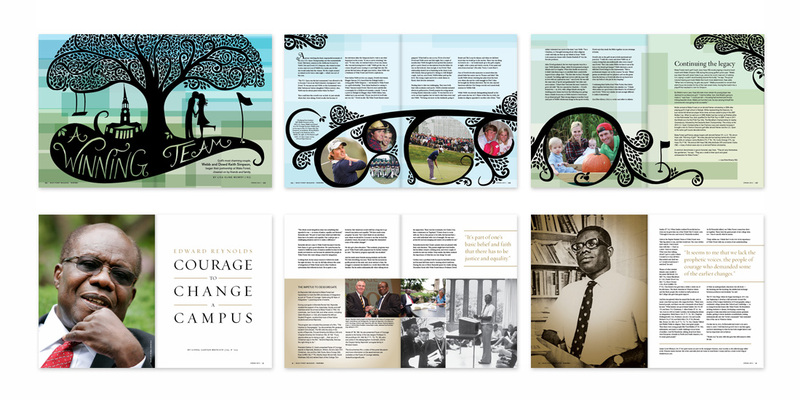 Two articles for Wake Forest Magazine, one about Webb and Dowd Simpson, and an interview with Ed Reynolds. 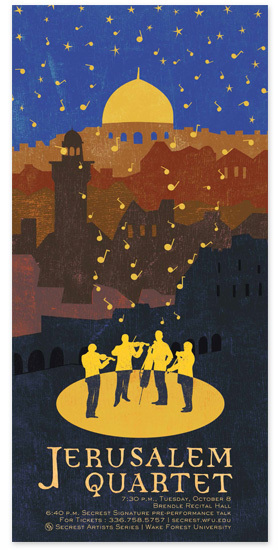 These posters are two in a series of six for performing arts groups in this season of Secrest – Danu, A Christmas in Ireland; and Venice Baroque Orchestra. Three articles for Wake Forest Magazine. Photography by Christine Rucker, Ken Bennett, and Walter P. Calahan. 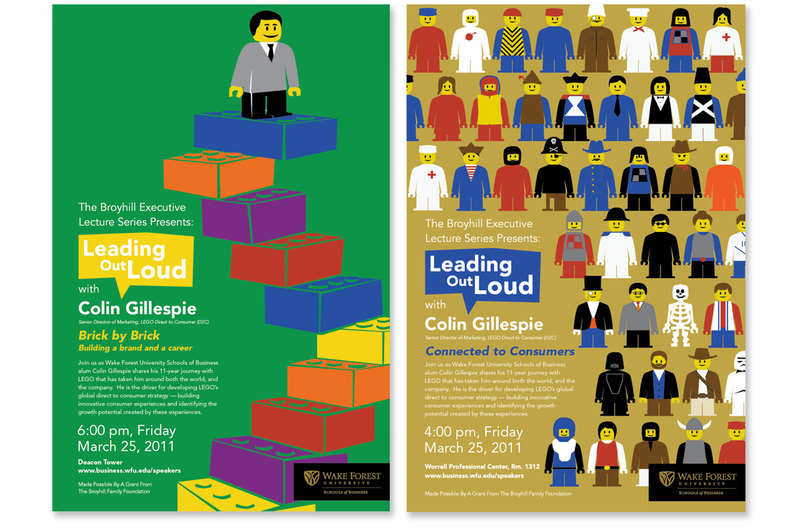 The Leading out Loud series brings speakers to the School of Business – this speaker was from Lego, so I created an option with a wide variety of Lego people. 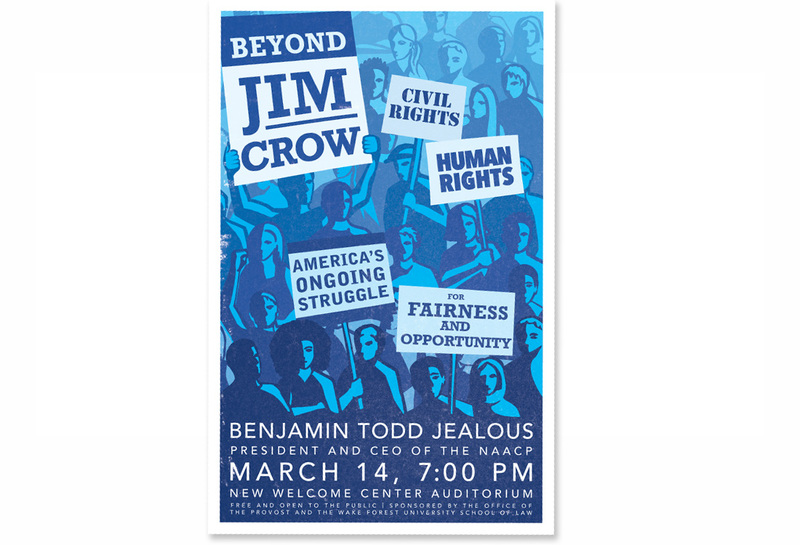 Poster for a talk by the president of the NAACP. 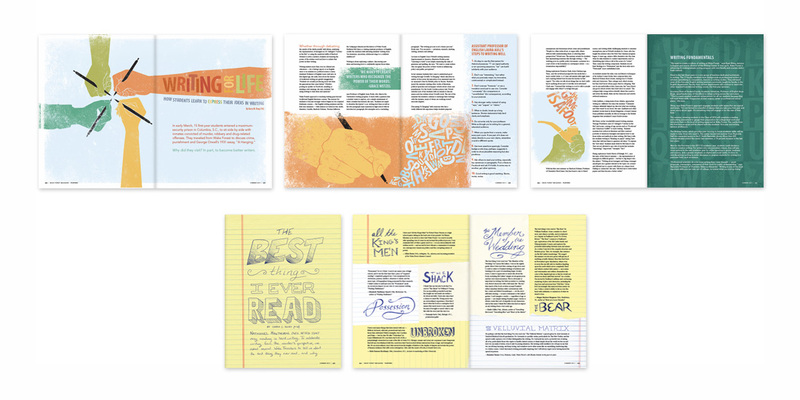 Two articles designed for the Wake Forest Magazine – illustration and hand-drawn type. 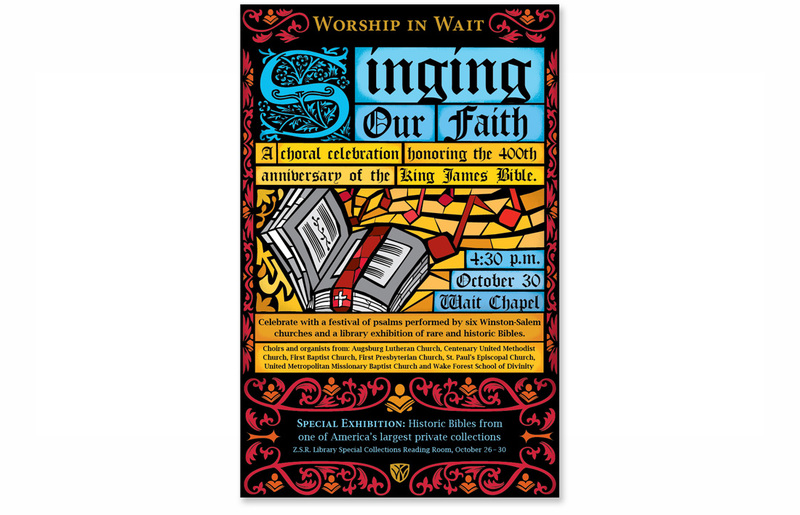 A poster for a celebration of the King James Bible’s 400th anniversary.